Make sure to come and link up any of your yarn projects at my weekly Yarn Fanatic Party! This week I am giving away a year subscription to Happily Hooked, which is an awesome online crochet magazine. I am still knitting my Berries Blast Beanie. I've decided to do the top in stockinette instead of the garter stitch. Hopefully I know what I'm doing well enough for it to work! I almost purchased yarn yesterday. I have a special project in mind and the yarn that I wanted was on sale at Michael's and I had a 20% everything (including sale items) coupons. For some unknown reason it never let me check out. Oh well. I just might have to go yarn shopping this weekend. Looks great so far :-) Love the color. Have fun yarn shopping! 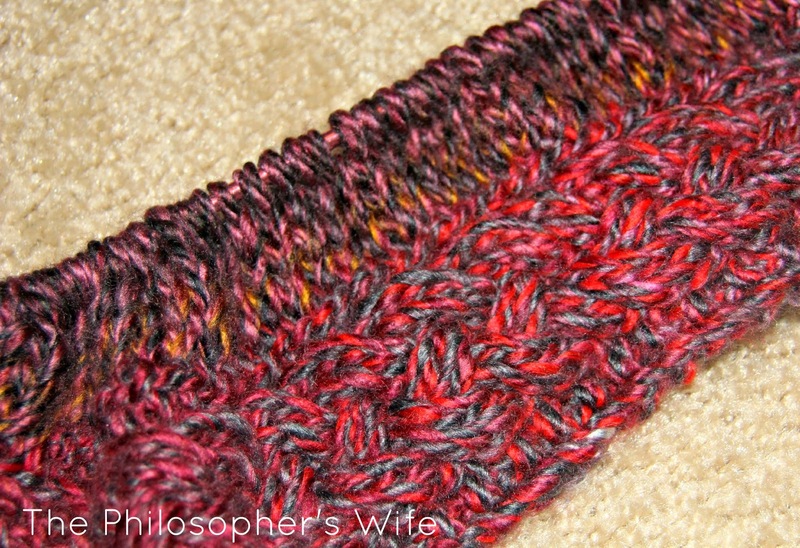 I love this yarn! It's so pretty. I wish there was a yarn store here, any yarn store. Its about 2 hrs to the nearest one. I feel your pain about Michael's. Love the Beanie. I follow and share and I will link to your yarn party, of course! Fingers crossed! Thanks! Beautiful colorway! Does look a tad busy for cables, but quite scrumptious looking.